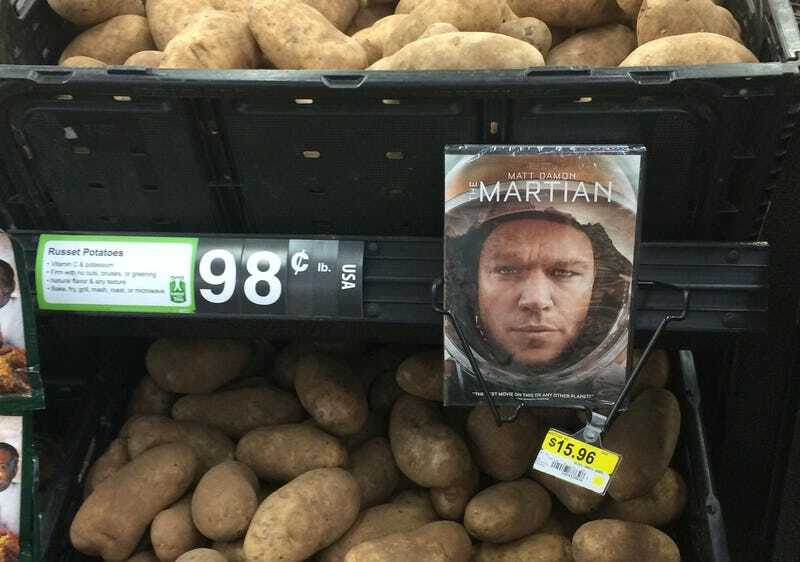 This photo of a DVD of The Martian being sold next to potatoes has gone viral. If you’ve seen the movie, it seems like perfect cross-promotion, done perhaps by some clever person at a random grocery store. But it’s no accident. The Albert Bartlett potato company has an official deal with Twentieth Century Fox to use Matt Damon’s face and their Martian movie to sell Albert Bartlett’s spuds. Specifically, their rooster potatoes. They’re even giving away a free trip to the Kennedy Space Center in Florida. If you’ve haven’t seen the movie (spud spoiler alert) Matt Damon’s character is stranded on Mars and has to figure out a way to feed himself. Aside from the rations already around from their aborted mission, Damon’s character finds a brilliant way to grow potatoes in the Martian soil. So this marketing cross-promotion here in the real world makes perfect sense for a potato company. Heading to this world renowned NASA facility, you’ll be put through paces on their mind-blowing Astronaut Training Experience® program to see if you have the ingenuity, spirit and strength to survive in space! Beginning with a briefing from a veteran NASA astronaut, you’ll learn how to execute a high-Earth orbit to dock with the International Space Station and land the space shuttle at Kennedy Space Center. Then, prepare your body for space flight using state-of-the-art simulators like the Micro-Gravity Wall, Multi-Axis Trainer and the 1/6th-Gravity Chair which creates the feeling that you’re walking on the moon. With your training complete, you’ll put your skills to the test with an incredible simulated space mission to see if you’ve got what it takes to become The Martian! A behind the scenes tour of Kennedy Space Center Visitor ComplexSM - known as the Gateway to Space – completes this once – in – a lifetime prize that’s sure to be out of this world. There’s no purchase necessary, so go ahead and sign up for a chance to win the trip online. Sorry if the official promo deflates your hope that this was just a rogue grocery employee making a joke in the potato aisle. But virtually everything is bought and paid for — especially in the world of futurism. We might be decades away from manned missions to Mars, but at least you can... eat potatoes? Yay!